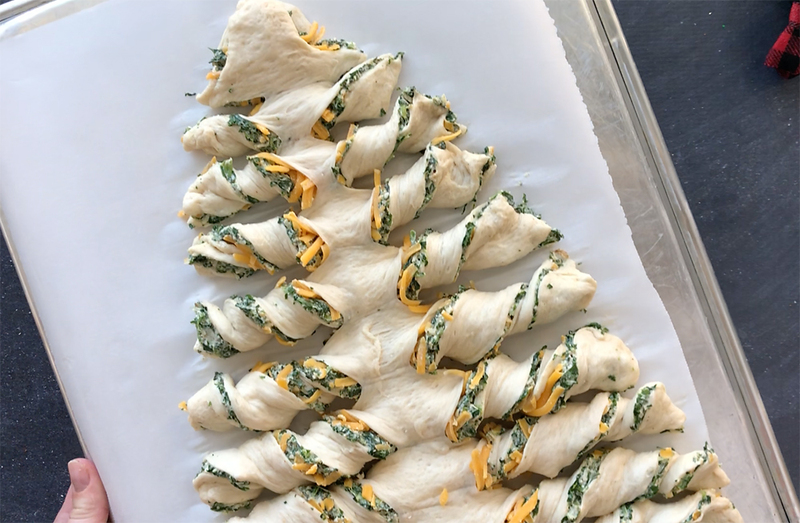 In today’s post: Learn how to turn refrigerated dough into an adorable Christmas tree with these spinach dipped stuffed breadsticks! And be sure to check out the football version for game day and the sweet nutella version for Valentine’s Day! As you know, my favorite part about any holiday (after the meaningful stuff like family and togetherness, etc.) is the food. Actually, my favorite part of any given day just might be the food, but hey, to each her own. The Christmas season is especially fun because there are all sorts of opportunities for delicious little snacks that you generally don’t eat all year long. I mean, we’ve already gone through more cheeseballs in the past three weeks than we do for the entire rest of the year, and don’t even get me started on Lil’ Smokies! 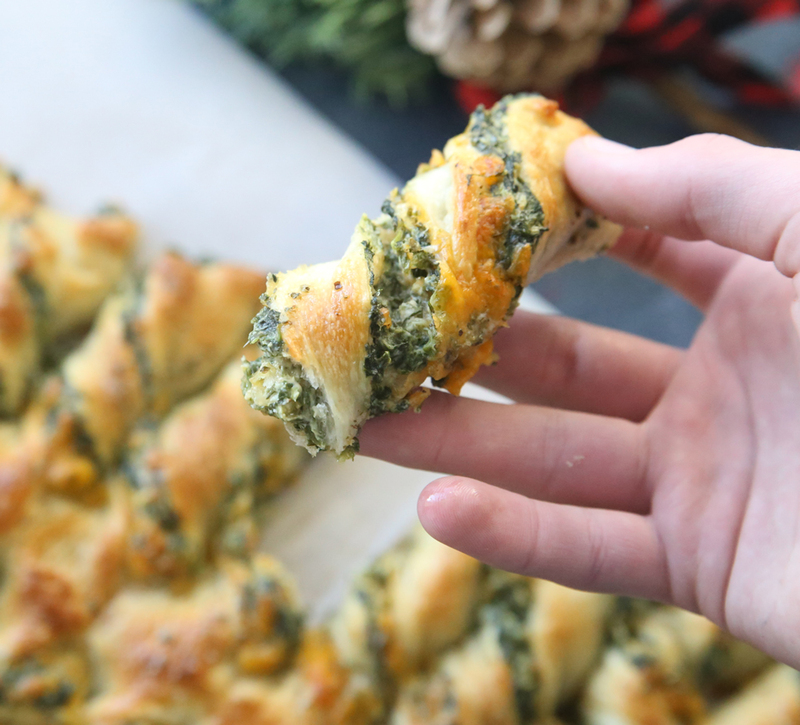 Anyway, I wanted to make a festive, but still easy, holiday snack you could take to any party, so I came up with these Christmas tree spinach dip breadsticks. Need a hilarious game for your Christmas gift exchange? Check out the LEFT RIGHT game! You’ll start by mixing up the spinach dip ingredients. Make sure to thaw the frozen spinach (or just defrost it in the microwave) and squeeze it in handfuls to get most of the moisture out. Then use a hand or stand mixer to mix it with the softened cream cheese, garlic, seasonings, and cheeses. This gives you one large triangle and two smaller ones. 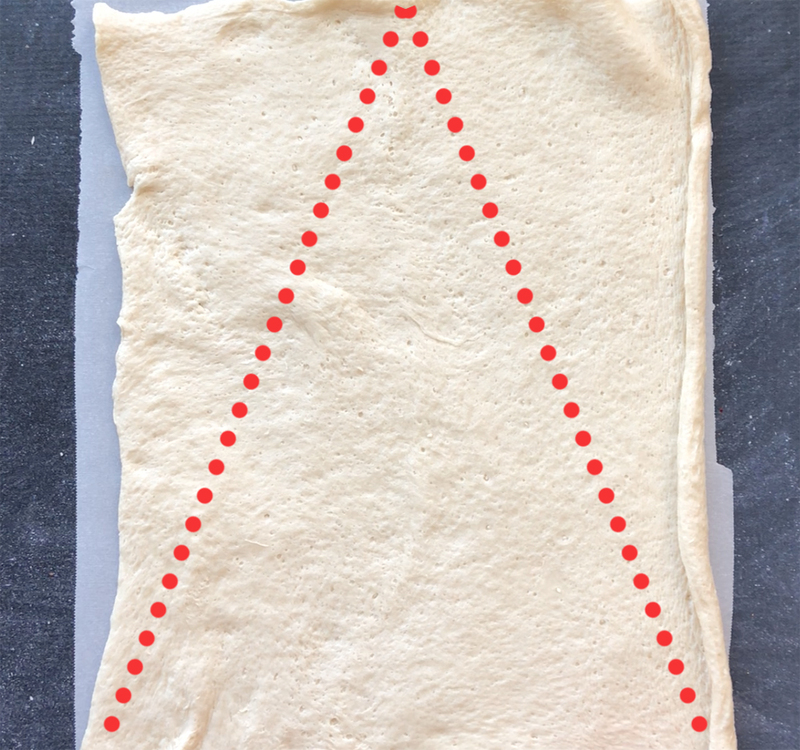 Transfer the smaller triangles to a second piece of parchment paper, placing the long side edges together, to make another large triangle. The dough will stretch out a little as you move it around – no biggie, just gently tug it into the shape you want, pressing the two halves together in the middle. This will be the base of the breadsticks. I also gave the base a short little trunk. Sprinkle on the remaining cheese, and then top with the first triangle of dough. You’ll likely have to tug at the dough a little bit to make sure it completely covers the base triangle. Using a pizza cutter, cut slices from the middle to each edge about every inch down the triangle as shown below. Don’t slice all the way across; leave about an inch down the middle of the tree intact. Grab each “slice” and twist it to form a tree shape, as shown below. For the top slice that’s very short you’ll just give it a half twist; as you go further down the tree and hit longer slices you’ll give them two or three full twists. Bake at 400 degrees for about 22 minutes until the bottom is completely cooked through. The top is going to get nice and browned, but make sure to check that the bottom is cooked through. If you are cooking on a heavy cookie sheet, like I did, you may want to cook this on the lower rack in your oven. Once out of the oven you can brush the breadsticks with melted butter, garlic salt, and seasonings. Then serve it up while it’s still warm. Everyone can tear off a breadstick or two to enjoy. So I’ve had lots of questions about this recipe, and I’ll try to answer them all right here! Q: Can I make this in advance and rewarm at the party I’m taking it to? A: I’m sure you can, although I have not done so. This is a lot like a pizza, and like pizzas will taste best directly out of the oven, so your best option may be to shape it right before you leave for the party and then bake it once you get there. However, that’s not always an option. So you’re next best bet would be to bake right before you leave and then wrap it in foil and just serve it warm-ish (still tastes just fine!) or pop it in the oven for just a few minutes to heat through at the party. Some readers have suggested baking on a baking stone and transporting on the warm stone to keep it hot. Q: Can I shape this in advance and refrigerate or freeze until time to bake? A: You can certainly give it a try, but I wouldn’t recommend it. The refrigerated pizza dough from a tube that I used may not hold up well to sitting in the fridge for a few hours before baking. Q: Can I use a different type of dough? Homemade dough? A: Of course! You’ll just have to adjust your baking method a bit. Homemade pizza dough should work beautifully – just let it rise a bit before shaping and then watch it while baking as the bake time will vary a bit with different dough recipes. 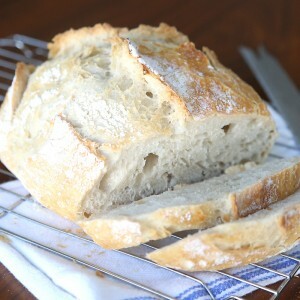 You could also use frozen Rhodes bread dough: you’ll just need to thaw it and allow it to rise before shaping. Q: I can’t find the “thin” pizza crust, just regular. Can I use that? A: Sure! Either you can sprinkle it with flour and gently roll it into a bit larger rectangle to begin with, or you can just make a tree that’s slightly smaller and a little thicker. Q: I hate spinach. Can I use a different filling? A: Absolutely! I made a pretty tear&share bread using a pesto filling in this post, which was delicious! Other readers have recommended a buffalo chicken filling, which also sounds yummy. Just avoid really runny fillings as they may leak out too much and make a mess. Q: Can I use store-bought spinach dip instead of your recipe? A: Yep, that should work just fine. The only potential issue is if your prepared dip is very runny – my recipe is quite thick to make sure it doesn’t leak out while baking. Q: Can I use crescent roll dough, phyllo dough, or puff pastry instead of the pizza dough? A: I haven’t tried any of these options so I can’t say for sure, but I’m thinking it would work just fine with any of them! Just watch the cook time (and check some of the comments – readers are sharing different things they’ve tried). And be sure to check out the LEFT RIGHT Christmas gift exchange game. It’s so much fun! « Easy paper strip Christmas ornaments kids can make! AUtumn, I love your web site. I’ve been with you for a long time and have watched as things have grown and developed and become bigger and better. Congratulations! 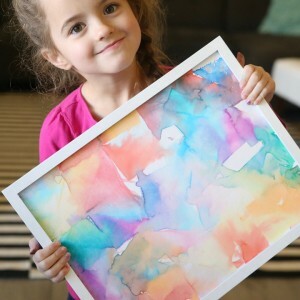 I love your style and identify with the “mom” feeling your page conveys. You have more adverts on your site which is a sign of success. I know they are important but please don’t let them take over your page like other sites have. I have unsubscribed from several sites because the page is so hard to navigate through all of the advertisements to be able to really see the intended content. I wish you continued success, my friend and thanks for your realistic perspective. I love it!! I understand where you are coming from but id like to ask if you’d be willing to contribute to the site. You’ve mentioned that you love it and I’m sure a lot of people do as well so if she made it possible to donate monthly to her site so she wouldn’t have to run ads, would you do it? Goat cheese with garlic and herbs and finely diced sun-dried tomatoes Yum! I am with you on the ads issue. I am a blogger and have made sure that people who come to my site get the information they need and that my site does not waste volumes of time trying to find the “Next” button or to see the section of an article I am reading because it keeps having pop up ads right in the middle of it, Irritating : ( and costs writers subscribers, even sites with excellent content. This site has great, useful, information. Please keep your material accessible to readers! We don’t like spinach, what else could I use for the filling that would be tasty & delish? Any ideas would be appreciated. Thank You for sharing. I’ll be waiting…..!!! Drained Pesto would be green and pretty and very tasty! I am going to try it with artichoke, spinich dip. Should work the same as straight spinich. I made it tonight for a neighborhood party. Was a great hit. I used Costco’s artichoke, jalepeno dip vs the spinach listed in the recipe. I was very nervous about burning the bottom and not getting the middle cooked through. I did put tin foil over it the last 5 minutes as it was getting a bit dark and I was worried about it. It was really pretty, and the blended flavors were wonderful. Did you still add all of the other seasonings? how did you make the little trunk? Did you add the Parmesan and Cheddar? I baked mine on parchment paper on the back of a rimmed baking sheet so I could slide the parchment onto a serving tray. Once in place, I gently pulled the paper from under the tree. I hate cooked spinach, however you really don’t notice the spinach, this is really good. I have used chopped broccoli and it was very good. Hi! I am thinking of making this for Christmas but with the pizza version. Did it turn out OK, or was the pizza sauce too watery? I made a warm turnip green dip that was delicious. Subsitute turnip greens for the spinach. Try using chopped frozen broccoli. That should work. I use a hot breakfast sausage (preferably Jimmy Dean or Tennessee Pride) browned and drained, 1 block of cream cheese, and 1/2 lbs of mozzarella (shredded)~mixed together and done the same way! Try it! Your recipe sounds delicious! What type of dough do you buy? Did you add the spices as stated in the recipe to the sausage-cream cheese mixture? Try it with Buffalo Chicken Dip! use cans of chicken –like a buffalo chicken dip..its wonderful!! I’ve done something similar to this, using a hot cheesy crab dip, and it was really good! This would keep it thick without adding too much moisture. You really don’t taste the spinach. This is very good. Made it for our family Christmas party last Friday and they were gone in a flash. How would you warm this up to serve it if you take it to a party? In the recipe it says 1 c. Of mozzarella or cheddar. 1/2 c. goes in the spinach recipe the other 1/2 on top. I don’t understand how you take this to a party. Do you bring it uncooked and ask to use the oven so you can serve it warm or can it be cooked at home and warmed up at the party? It looks great and I want to try it for a party I am going to. Either way should work! It’s a lot like pizza – it will taste best straight out of the oven, so if you can bake it there that will be the best. But pizza still tastes good warm and rewarmed, so serving it warm or at room temp is also an option. You could do this with buffalo chicken dip, add green coloring if you need it to be green! Buffalo chicken dip sounds like a brilliant idea too!!!! I may need to try that! Do you think I could add chopped artichoke hearts to this? What about using pizza sauce, with or without meat, and “decorating” it with olives, mushrooms, red peppers, etc.? Messy, but fun and pretty. This would appeal to a wider range of palates than those who like spinach. I love spinach! Would put some pine nuts in with the pesto others suggested. A dessert version might have nuts and cinnamon bun sauce. Try it and lettuce know! FUN! Hi! I’ve never tried making it ahead and freezing it. Think of it like pizza: would you freeze a piece of pizza and then warm it back up again to serve? I’m not sure how well that would work. Good luck, and let us know if you try it! Autumn, made this today, I substituted onion and chive cream cheese and added cherry tomatoes to serve as ornaments. 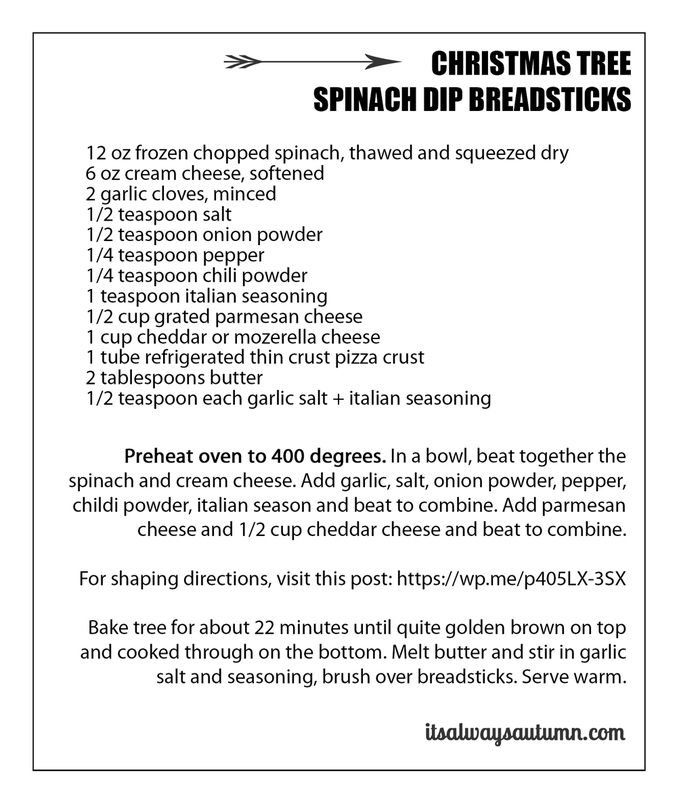 It was a HIT everyone wanted to know why I only made 1.
can i use something like store brought spinich dip or knors spinach dip recipe and bake then serve at to.temperature? Did the spinach dip work? I bought spinach dip too… hope it worked. ent rolls and a spinach and artichoke recipe? I just made the recipe with crescent roll dough and it was wonderful. It is a lighter, fluffier finished product. The pizza dough is a little heavier.. great recipe! Hi there! I bought the crescent rolls too to try it out. How many crescent roll tubes did it take to make it a decent size? I was thinking two for each the front and back but curious how you did it. Thanks!! I just used one can and it made a nice size…. 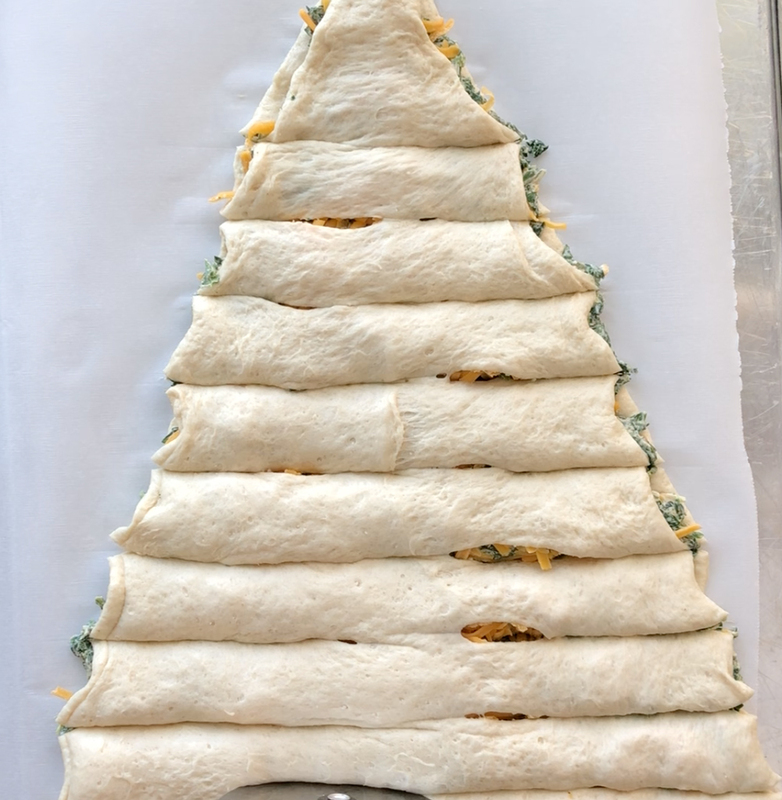 I am going to make one with crescent dough/spinach and I am going to make a pizza filled one with the bread stick dough for a New Years Party… I love the look and the taste is outstanding. Also, it is very easy…. I didn’t see any answers to the holiday party/warm up question…. Bake it minus 5 mins, wrap in tin foil and broil 4 mins on low before sebong! I’m interested in the “warm-up” question too. I was thinking maybe I could bake it on a rectangular pizza stone, then keep it on the stone, which will retain some warmth. Then drive really fast. Hahaha. I have a cardboard box that is the same size as the stone, long and not too deep, that I’ll put it in, with some big potholders on the bottom. Interested in other ideas too. Once cooked, put this into a silver lined tote (I bought mine at Sam’s a few years ago) – similar to the pizza delivery guy’s tote. In fact, when I pick up a pizza that i have ordered over the phone, I put the pizza into my silver lined tote and it is still hot when I get home. It would surely work for this fabulous treat! Can you make ahead of time and refrigerate over night and bake in the morning? I’ve never tried it Debra, but since the recipe calls for the refrigerated pizza dough from a tube I think I would not recommend that. I made it the day before and left it in our extra fridge covered with plastic wrap and it baked up great but the next time I’ll put little to no filling in the center or cut each branch closer to the center. The tips of my branches got really dark but the center stayed raw. I would definitely make this again though. I had some filling left and cooked it briefly in a sauce pan and added it as topping to a couple baked potatoes. GREAT! I wonder if you could use Phylo instead of pizza dough. If it would be too flaky and fall apart as you pull it apart. I recently made this with phyllo and Nutella/almond filling. It’s delicious, and the flakiness wasn’t too bad! If you get it ready then bake it just before you leave for party; OR, if you bake it earlier, warm it in your oven as you get ready for the party; THEN, how about wrapping it in heavy duty aluminum foil. You could transport it on a cutting board (you could use the board to serve it on); however, if you’re worried about it slipping off the board during transport, use scotch or masking tape to keep it in place. It won’t hurt anything because you’d be running it across the foil to the bottom of the board. I hope I made sense to you. Cripes, I’ve used bath towels to keep pots warm in transport! I forgot I even had a bread brick! Thank you for mentioning it [email protected] I just got it out so I don’t forget on Christmas! I was also concerned about it cooling to quickly & my party was only 5 houses down the street. I opted to use her oven to be sure. The tree was well received. A bit salty for my taste so will make tweeks for Christmas. I have just made this. Lovely idea and looks fab, it’s just way too salty. I will try again, with less additional salt and chilli. I loved this but did have trouble getting it off of the metal baking pan even though I greased it with solid shortening. My branches cooked way before the center so next time I’ll put just a smidge of filling in the center. After the branches were eaten I had to put the center back into the oven to finish cooking so you definitely can reheat it. SReally want to take this to a party next week !! so I’m super interested in how to keep it warm or …. Yuk. It will ruin the texture…just like it does microwaved pizza. how do you make the trunk part of tree? Looks like when you twist up the last portion it makes itself. did you get an answer to this? i would also like to know! I’m really keen to try your festive recipe but am only familiar with Pampuss puff pastry sheets. Have not heard of Refrigerated thin pizza crust in a tube. Could you show a picture of what it looks like…and/ or suggest whether pastry might work? I just purchased a can of Pillsbury Thin Pizza Crust. It was difficult to find! My Walmart carries it bus was out of stock. I was able to finally locate it at Publix. I’m afraid Pillsbury’s Classic Pizza Crust would be too thick. I used puff pastry. It’s fine. The only pizza dough I have seen is pre coated with a tomato sauce. Just wondering how long you left this in the oven using puff pastry? Hi! I think the puff pastry would work just fine! Be very careful using peff pastry and how big you make the tree as all the butter in puff patry *can cause your oven to catch fire and almost burn the house down* …. Everything is fine at our house now but this dish turned out great after all the flames were put out! Oh my goodness! I’m glad everyone is ok and thank you so much for letting us know this could be a problem. I love this! I am going to make one change…I’m adding chopped pimentos for a touch of red! Charlotte, That’s a good idea, I thought of using cranberries, myself! If you put it in the frig over night do you have to let it come to room temp first? Hi! I’ve never tried making it and refrigerating it before baking, so I don’t know if that would work. 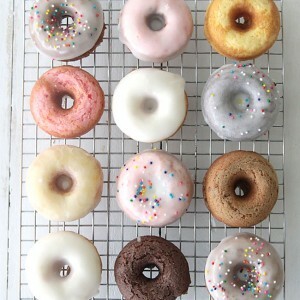 The canned doughs are meant to be baked right away, so I’m just not sure how that would go. I can’t find thin crust pizza dough anywhere where I live, do you think just a regular pillsbury pizza dough in a tube would work? Or would it puff up too much? I think it would be too thick. I found the Pillsbury Thin Crust at Publix and Walmart (Super store with groceries). Hi Shauna – sure you could use a regular one. Just put flour down before you unroll the dough and then put some flour on the top side of the dough and gently roll it or stretch it out a bit until it’s roughly 9×12 inches. Then shape as directed! Can I put this together ahead of time, refrigerate and bake later? Test it out and let us know! It’s fun to see what works and doesn’t. I’m updating the post right now with answers to all the questions – thanks! Can you cheat and buy the spinach dip already prepared? As a Greek girl, I would make the spanakopita filling and use that for a fuller flavor and result!!! My daughter is vegan. Can you tell me what dip and cheese you are using? I’d love to make something she would eat also. Hi This looks like a fantastic and I am going to try to make it today. But I am in Australia and unfortunately we do not have pizza crust dough in a can. I have bought fresh pizza dough balls and will roll these out to use. Just wondering if anyone can tell me roughly the size of the rectangle that the dough in a can comes in ? It looks to be about 12″ x 9″ (30cm x 23cm) is that about right? Yes, I think 12 x 9 inches is just about right! Debbie I’m also in Australia and I’d like to know where you were able to get the *fresh pizza ball as I’ve NEVER seen any. It’s a pain when we don’t have Pillsbury like in America for wonderful recipes like this. What do I do with the remaining 1/2 cup of cheddar/mozerella? Never mind, when I watched the video, it becomes clear that the 2nd 1/2 cup is spread on the dip after the dip is apread over the crust. Think I’ll serve this Friday at a family party. If you can make the two dough cut outs into even the semblance of the shape of a tree, you are truly gifted. Once you move them after you cut, it’s all over. Dip is going in a bowl and I must go back to the store for crackers to arrange around it. Really wanted to take it to a party tonight. Disappointed in my dough-shaping impairment. I, too, almost gave up halfway through, BUT I persisted, and was delighted with the results. Try, try again. I felt so accomplished after completion, and it was beautiful to look at and delicious to eat. Making it again for a party tomorrow. I just make this with Phillsbury thin crust (not in a roll not tube.) It is too thin, wishing I had another one as I have double the filling that I need so will have to try with the regular dough tomorrow. The dough stuck to the paper and didn’t want to twist because it was so thin. Wondering if I should have tried with regular homemade bread dough. I’m bringing to a Christmas baby shower so will be transporting on pizza sheet and then rewarming there. I am guessing it will taste good, but it doesn’t look very good right now. You can use almost any kind of filling with this (I’ve made other braided bread type things before. Mix pesto with some cream cheese and parmesan same thing with sundried tomato pesto. You just don’t want it to be too oily a filling or it will all leak out. This popped up on FB this past week and I thought maybe I can create this shape for Christmas gathering. I tried it out tonight for a family supper and everyone really liked it, even my husband who does not like cooked spinach. Creating the top layer was challenging but the finished product looked pretty good, if I must say so myself. We made this for a reception after Lessons & Carols. It was a big hit! “You made this??? Wow!” Thanks for giving such great step by step instructions. Turned out beautifully. Glad it turned out, thanks for letting me know! What about pizza crust base and puff pastry top? I just made this recipe last night and it was a hit. Would substituting fresh spinach for the frozen spinach change anything? Hi, Autumn. I’m a male whose kitchen repertoire is, well, limited. With my wife’s help assembling ingredients I did make a passably aesthetic Christmas Tree spinach dip for a gathering tonight. Thank you so much! I’d chill the dough in the freezer for a while to help make it easier to manipulate (mine had a mind of its own!). Add a line to add the other 1/2 cup cheddar (or mozzarella) cheese after the mixed ingredients are spread on the base triangle/tree. Two misspellings you may want to correct are “mozzarella” in the ingredients list and “chili” powder in the 1st paragraph of instructions. Also, 20 minutes in the oven was plenty for me. Again, thank you for your inspiring me to try something a little different! To all who have asked – I made this in advance & it turned out delicious!! I prepared it the night before, stuck it in the fridge, and then baked it around noon for a potluck lunch the next day. I do this often with bread doughs, and it always seems to work well. I bet you could make this, freeze it, move it to the fridge the night before you want to bake it, and then bake it the next day when you need it so it’s hot & fresh! Crowd pleaser & super easy to make! The dip recipe is at the top of the page. This was so good and easy to make! It was beautiful on my party table! Thank you! Inside. I believe the video shows brushing with butter and maybe some seasonings. I, too, was confused. BUT the answer is you put 1/2 IN the mix and AFTER it’s spread on the bottom tree, you sprinkle the other 1/2 cup on top of spread BEFORE adding top tree-dough. i FORGOT second 1/2, but it was still delicious, and will makr IN RED on recipe — I was just too freaked out on this, my first making of the recipe. And I sure wasn’t going to try to life that second layer of dough off to sprinkle the cheese!! I really wanted to make this for Christmas, but couldn’t find the actual recipe. Am I missing it? Right below the large photo. Or you can look it up on website. My son and I made this today and it is awesome! Thank you for the recipe and the tree idea. I will be making this again…soon! Such a cute idea! Was just wondering if it’s better to use real shredded Parmesan or the grated dry cheese? Made this for a Christmas party yesterday. It was a big hit! I made the spinach dip the night before (used fresh spinach and added sundried tomatoes) then put it together in the morning. Baked it for 17 or 18 minutes then re-heated when I got to the party (few hours in between). This did not work at all! The directions are confusing since it says “breadsticks” in one place “thin pizza dough” in another. Not sure if this was referring to the type of dough or calling it breadsticks even though the dough was from pizza dough. You need more instructions regarding how to handle the dough. It was very difficult to handle. Got too sticky too quickly. I’m very disappointed. I think it is a good idea and a beautiful presentation. It just didn’t work out as described. 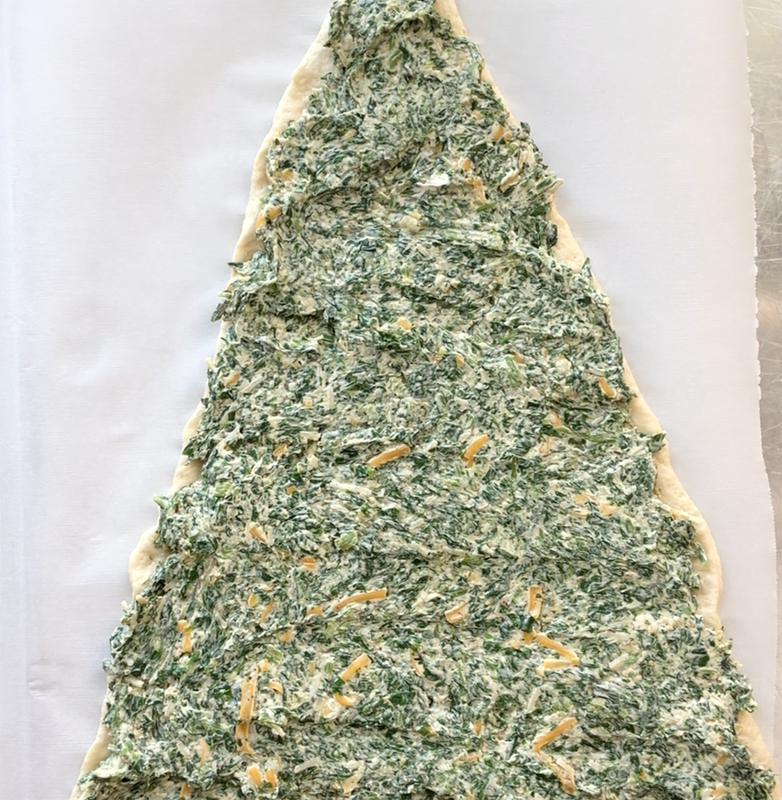 It finishes off as breadstick branches on a Christmas Tree but starts out with a rectangle of thin crust pizza dough. I rolled it out on a piece of waxed paper for better handling. 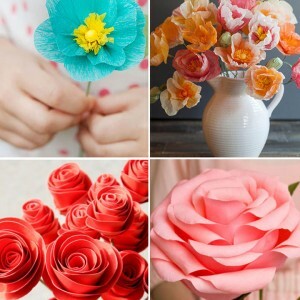 You can take the two extra dough pieces and put them together on another piece of waxed paper, mold the two together with presses of your fingers then roll the dough out with a rolling pin, up-end the dough over the bottom triangle and use your pizza cutter to cut away any ragged edges. Hope this helps. Oh and also don’t put a lot of filling down the center as the branches bake way before the center. What are the dimensions of the piece of dough that you roll out? This looks super yummy! Can you use fresh spinach instead of frozen? Maybe just sauté it a little so it’s smaller pieces than big leaves? Has anyone made this without cheese? Have you ever made this the day before you need it and then bake it the next day? What do you do with the other 1/2 C. of cheese? Can you prepare and bake it and then refrigerate it the day before. And just heat it up the next day? I tried this, and took it to two different parties this week, the first i did with the pizza dough but found 22 minutes a bit too long.. as i was eating it, i thought to myself .. this would be perfect with phyllo dough, which i tried the second time around. Not sure which one is my favorite but i do know they were a hit. People just loved the flakiness of the phyllo, so i’ll be making one more and most likely with the phyllo dough. Delicious. 5 Stars!! Loved it and turned out fabulous. Thank you. I made this for Christmas lunch and it was a big hit! Thank you! I made this for 2 parties over the Christmas holiday and it was a huge hit both times! What a great recipe and not to hard at all. Everyone loved it and and had ideas to make similar with other things inside, like pesto filling. I think I will try this again during the year but leave in rectangle shape and use another piece of dough to cover and just cut into strips for the twisted bread sticks. Wonderful recipe, thank you! I made this on Christmas Day and it was a hit and there were no leftovers. My frozen spinach only comes in a 10 oz package. I did not add any salt. I was confused that the ingredients listed 1 cup of mozzarella cheese and then adds only 1/2 cup later in the recipe. I used a whole cup of mozzarella and 1/2 c. of freshly grated Parmesan. I skipped the oil and garlic and it was a neat finger food. I baked the crust until it was golden brown a little longer than 22 minutes. My husband doesn’t “mind” when I make it again. It was very successful! Thanks for sharing this terrific recipe. Hi, I live in Australia and have never seen a tube of pizza dough. Has any other Aussie seen it ? If so where ? 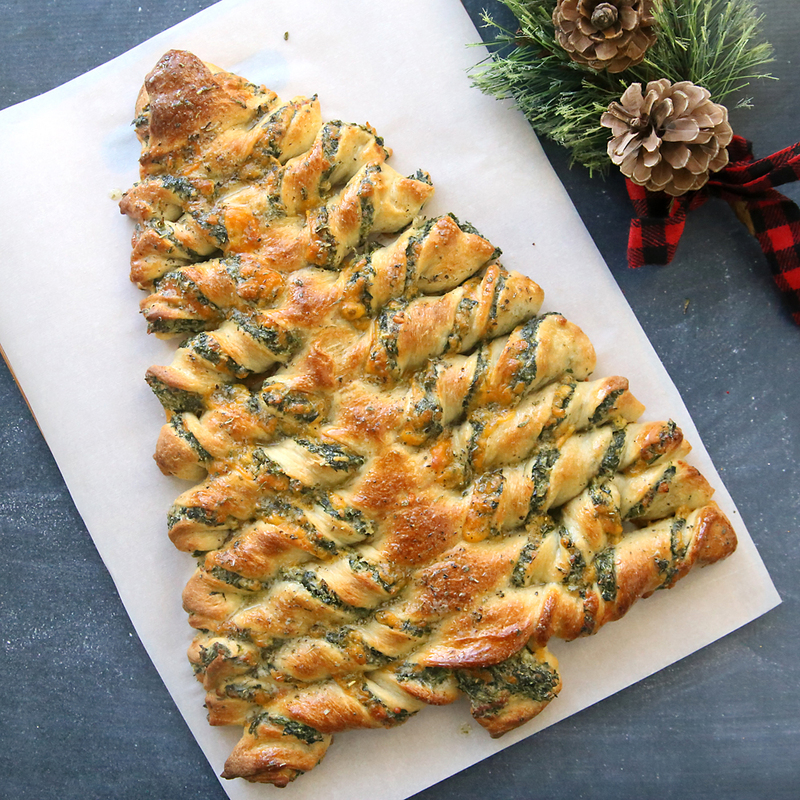 I want to make this so In the meantime, I will try puff pastry..
I’m just blown away by your creativity — and without your tutorial there’s no way I could figure out how to shape the tree branches — which is so freaking awesome!! I can’t wait for next Xmas to make one of these trees!! Also, while my puff pastry was delicious, it’s by definition a bit heavy/buttery and I think the pizza dough will be so much better (was going to say healthier, that might be a stretch — since it’s filled with cheese, ha) and a little bit less greasy. I made this for our Christmas Eve family dinner. It was a huge hit! Everyone loved it. I should have made more. Fortunately, I have the ingredients in the fridge and will make one for just us to eat with diner tomorrow. Will probably just go with a rectangle shape instead of the tree though. I think it will go nicely as a side dish to a soup. Yum! Thanks for a great recipe. My coworker made this for a party and it was delicious!! My favorite dish at the party! I tried and failed. Felt I should have had 2 pizza crusts, because what I cut was not big enough for the top and when twisting the Tostitos pre made spinach dip it just was too runny and leaked out. This turned out great! They don’t sell the thin crust here in canada so I got regular and stretched it to the size of my sheet pan. I thought I was doing a bad job shaping until I was done and it looked like a tree! It baked up beautifully! A little too bready, I think I’d try to thin it out more next time, but great tasting! I was so surprised at how easy this was to actually make and it tasted great and the end result was so pretty. I made it for a Christmas Eve party and it was a hit and gone instantly! I will definitely make it again. For those that say they don’t care for spinach, it definitely does not a strong spinach flavor, it tastes so good. I want to make it again just because. Thanks for sharing. Made this for Xmas. Loved how it looked, but was far too heavy/filling. Maybe make the branches thinner than suggested so each serving isn’t so filling. This is wonderful! My DIL made this for Christmas, and we wanted to have it again. We tried tonight, with what we had on hand … a tube of refrigerated flaky biscuits, instead of pizza dough. I pressed half of the biscuits into a large square, spread the spinach dip over it, and topped it with a square made of the remaining four biscuits. After cutting the square into strips (using a pizza cutter), I twisted and then spaced out the breadsticks on the cookie sheet and baked. Not Christmas themed, but a wonderful side for any dinner! Omg. So I made two of these for my church’s after service coffee hour on Dec 24 ’17. One I made with your spinach dip, the other I made with problanos and jalapenos. Get 2 large size problanos and one good size jalapeno, roast them under the broiler on high in a cast iron skillet or on a gas stove over the flame till the skins are dark and smokey, then place them in a bowl with plastic wrap to cover so the skins can be easily pulled off. Pull the skins off and de-seed and then mash in a bowl. I used the same seasonings and a bit of ranch seasoning and a mixture of chihuahua and extra sharp cheddar cheese, and some sprinkled on top of the tree. The chihuahua cheese will leak a bit when baking, but when cooled, firms up a bit. Nevertheless, DELICIOUS. Wondering if Bacon and Chives will work good. Hi Autumn, I love the name of your website. Autumn is hands down my fav season. All year I hunt for Christmas recipes to serve Christmas week. This one is going in the recipe book. Thanks ! This was a big hit this past Christmas. I’m wondering if I could double the recipe and make it as a big rectangle, just placing one crust atop the other, and cutting in from the long sides. (Think of it looking a bit like a football field). What do you think? You could make a sweet version with white icing and raspberry jam and decorate with icing sugar and sprinkles. For those who are concerned about serving this hours after baking, fear not! I brought this to a work potluck where my best option was to bake it at 5:30 am and serve at noon. I slid it onto a cutting board (the only flat object I had big enough and sturdy enough to travel), wrapped it in cling wrap, and held it at room temperature until time to eat. We have only a couple of small microwaves and a toaster oven at work (plus all of the crockpots coworkers brought in), so there really was no way to heat this back up. Everyone still loved it and several asked for the recipe! And that’s even after I forgot to add the additional cheese over the spinach before topping with the second layer of pizza crust (it was 5 am, after all). I compensated by sprinkling a bit of cheese (combination of Parmesan and mozzarella) over the tops of the “branches” and melting briefly in the oven to resemble snow. I loved how festive, fun, and easy this was to make! It’s also a pretty solid concept that could be modified in any number of ways to suit different tastes and occasions. Easy enough for a soup night at home, but pretty enough for a gathering. Other than the cheese omission described above, the only other significant changes I made were adding a dollop or three of party dip and a quirt of lemon juice because my cream cheese was weirdly bland and decreasing the salt. It wasn’t the tiniest bit soggy, and forming the tree was very straight-foward and kind of fun. One last tip, if you have trouble getting your pizza cutter to cut evenly to the center strip, just use kitchen shears. Thanks for a great recipe that was fun to make and delicious to share! I made this yesterday for my daughter’s baby shower and used Pillsbury Pie Crust and shaped it in a wreath instead of a tree. I also served warm pizza sauce with it. It was delicious and everyone asked for the recipe. Thanks for sharing. i’ve done this recipe a couple different ways. instead of the pizza dough, i used the crescent dough. and then just a vanilla glaze icing on top and added a few star spinkles. that was the biggest hit ever! opps… forgot to put in there, the mrs dash garlic and her seasoning. 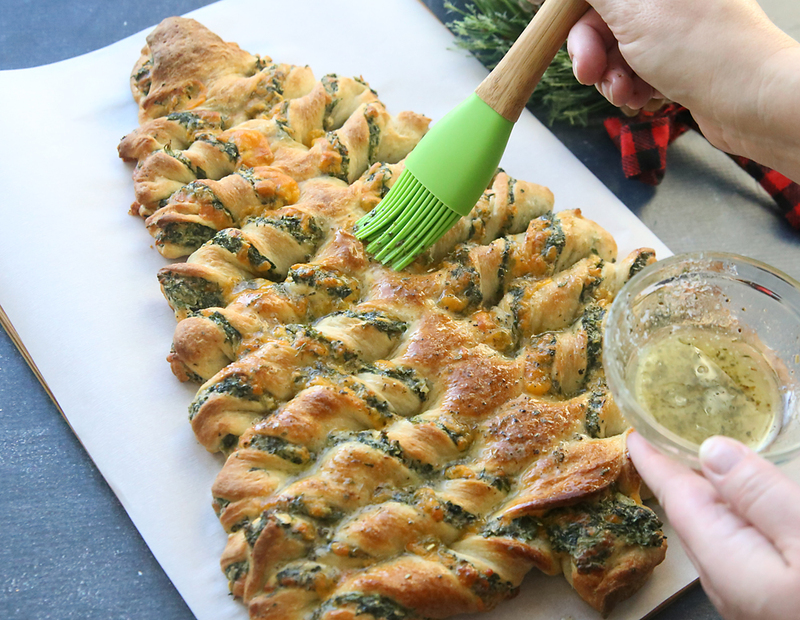 I am not a baker……wanted to know if it’s better to baste Christmas tree spinach dip breadstix with the garlic butter before or after you bake it? Or both?? I made this for my very first Christmas Eve party and it was a hit! Everyone loved it! Just made this and it turned out pretty good, thank you! I just wanted to mention that at about 15 minutes in, the small top of the tree started browning when the larger base had a bit more to go. So I put a piece of tin foil over the top to protect it halfway through, otherwise, I think it may have burned. Next time I think I’ll add some cayenne pepper to give it a little more kick. But looked great to bring as a party appetizer.